Left to right: Clair Keepers, Carrie Thomas, Doug Clement, and Sofia Jasani. Welcome to my Capstone project! This project is my effort in putting together a peer support group on campus. This is the first of its kind to be affiliated with NAMI. 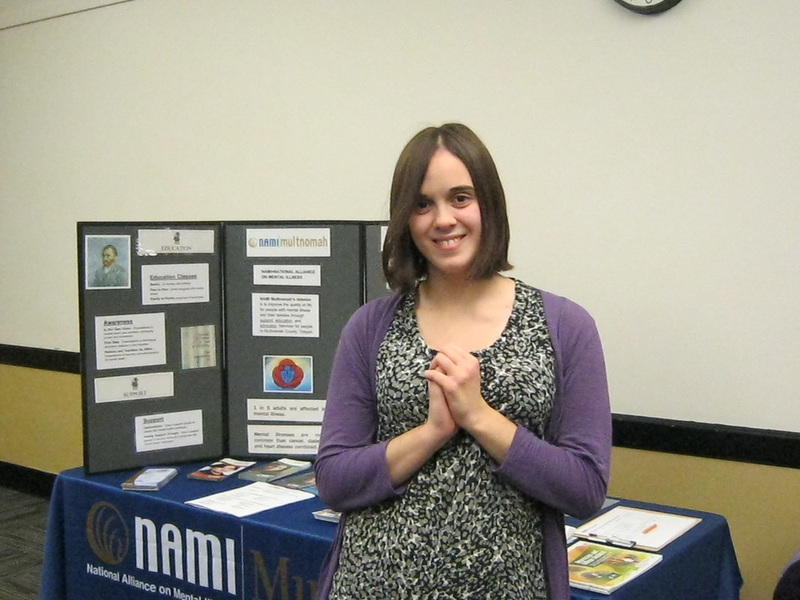 The mission of the NAMI On Campus club is to provide support for students, friends of students, family of, or anyone else who knows someone who struggles with mental illness. We provide advacation, raise awareness, and work to break the stigma of mental illness that is pervasive in American society. I had recognized the need of a support group during the formation of my final project for Sophomore Inquiry. There were support groups for anxiety and I believe one for depression, but there was none that I felt would instruct students on how to effectively deal with and overcome their triggers. Dr. Lowe taught methods in how to do this with Recovery International. This group meets the same way that AA groups meet, and it is structured the same way. My goal was to combine some of NAMI instruction with Recovery International to give students the important tools for dealing with the stress and triggers that college life can have. The idea of NAMI On Campus originally began with Carrie Thomas, a fellow student at PSU who during her spring term at PSU recognized a need for a NAMI club on campus when it was learned that there were none in the state of Oregon. My role came into place when I approached Sophia Jasami of NAMI Multnomah with an interest in putting together a student-led, campus-based support group ran kind of the same way that Recovery International is done. As I have learned, NAMI also does not have a support group on campus either, so I had wanted to put one together. My vision was to put it together in the model of Dr. Abraham Lowe Recovery International support groups where I could show students tools in dealing with their triggers. My goal is to put together a facilitated support group for students to come to on campus to find mutual support for mental illness related issues. The outcome is support, friendship, and learning skills that could carry on beyond their university years. To do this, I plan on implementing techniques I learn from NAMI support groups as well as Recovery International meetings. I plan on keeping in contact with NAMI throughout this process in order to continue advocation, support, and helping remove the stigma surrounding mental illness. I chose this area of work first and foremost because I have an interest in the area of mental health since I started Portland State University in 2013. During that year I was taking a leadership class for my Sophomore Inquiry and the final project was centered on mental health on college campuses. 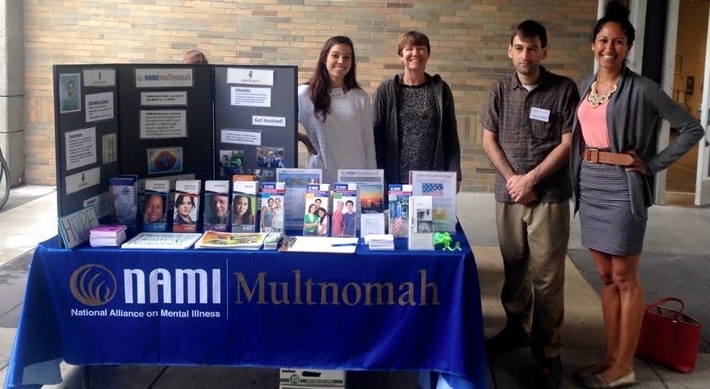 In essence, this is a continuation of that project because it was during this time I had contemplated starting a support group, and the second time during my college career that I had contacted NAMI Multnomah. Phase 1: This started July 30th when I met with Carrie, Claire Keepers, and Samantha Ing to discuss the details of the group, goals, and talk about our own life experiences. Basically a chance to get to know each other and our stories. On August 6th we discussed the constitution and bi-laws of the group, and what each of our roles would possibly be. We also continued to reach out to others and managed to get a couple more of people to join. 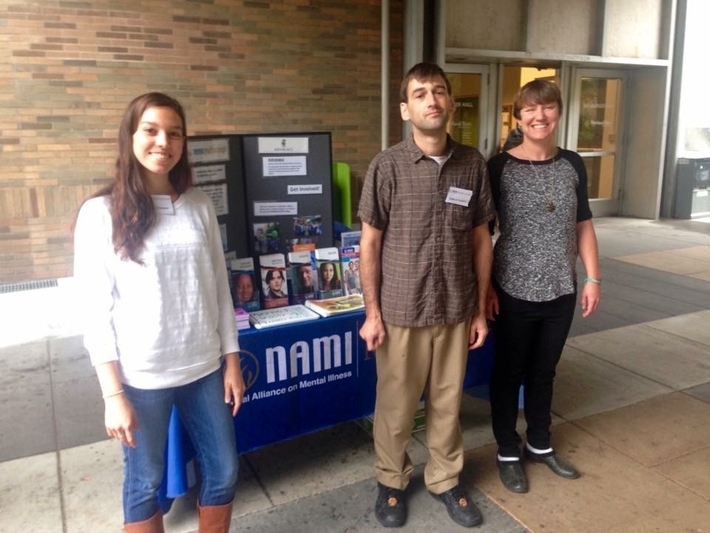 Phase 2: NAMI On Campus officially became a group on September 21st with a meeting between Doug, Carrie, and Clair. It is at this point that I realized that my original goal of facilitating a campus support group would not happen this term, and that I would have to change my goals. I decided that my focus is going to be on the process of creating the support group for facilitation next year. Phase 3: This is where the club is at right now. Carrie has attended some meetings that I was unable to attend to due to other commitments. These included leadership training and how to use Orgsync. This phase has been mostly about getting the word out via flyers and group meetings regarding what we do and the services we provide. 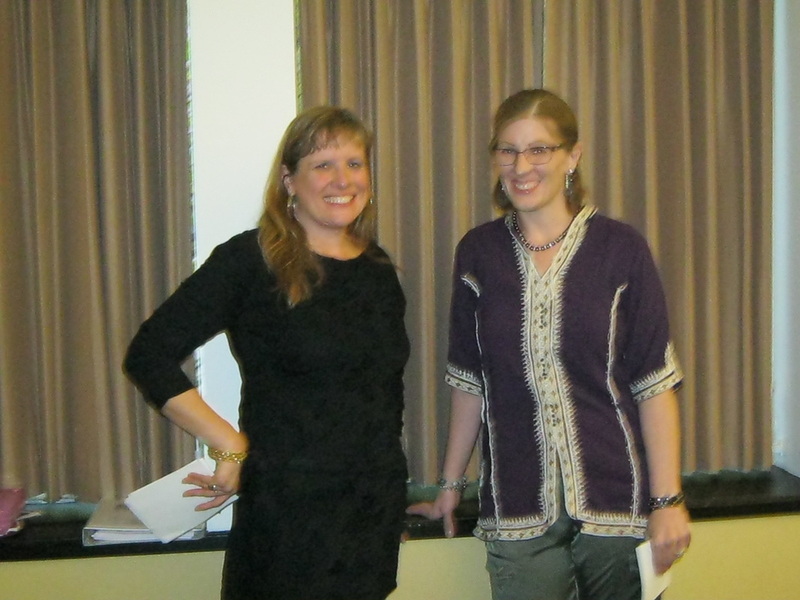 On November 11th, Carrie, Claire, and I conducted a in your own voice meeting in which we discussed to new club members what we do and what services we can provide to them, and exchanged ideas. Our upcoming event is [insert name here], where we have speakers discuss what it is like for a person to live with mental illness. My role during this phase is to reach out to other groups, and to attend other support groups so that I will be able to know how to put together one myself. 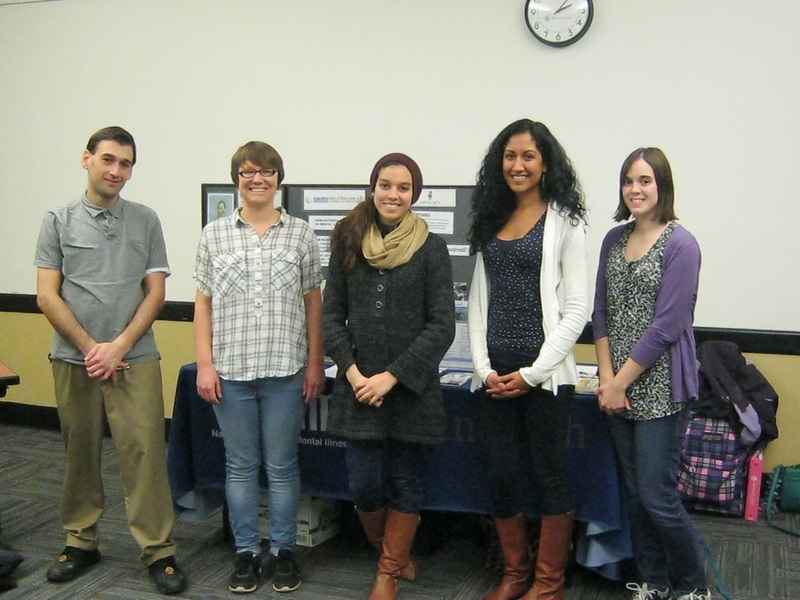 Diversity-NAMI On Campus is there to serve people of all backgrounds. Since mental illness knows no race, religion, or gender. In fact, in some cultures there is no recognition of mental illness at all. This makes the stigma all that more ingrained. Communication-Communication is critical for the success in this support group, or for the club in general. All members of the group must have the freedom and the ability to express his or herself fairly and having their feelings recognized and understood. Critical Thinking-This goal comes into play when you are understanding, or attempting to, think about one person’s culture and background and how that effects recovery. Social Responsibility-We have a social responsibility to take care of those who cannot take care of themselves. We should feel obligated to make sure that people who are dealing with mental illness get the help that they need to become functioning and productive members of society. I think social responsibility is the core goal of this group. My action plan has changed dramatically early on in this project. 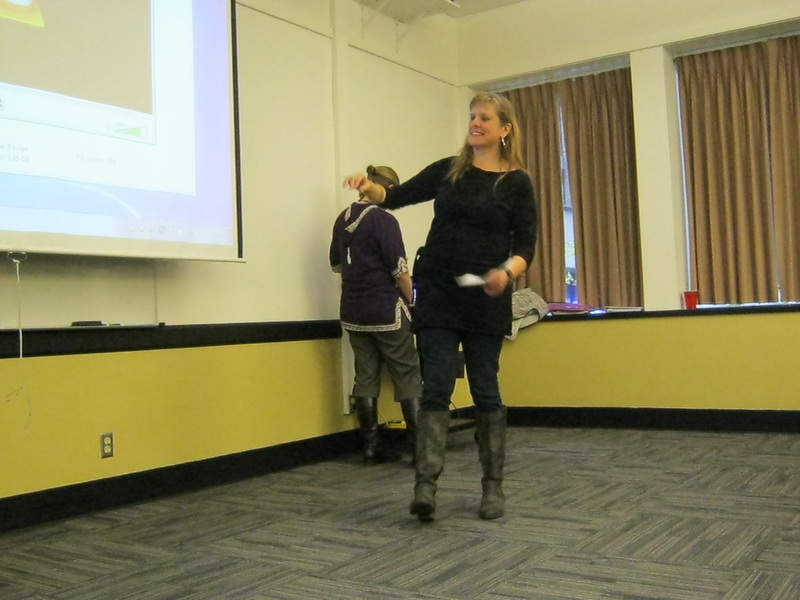 When I started, I did not know that I needed to attend facilitator training. This training is offered only once per year in January and I missed this year’s training. Had I know this, I would have taken this capstone project this winter instead. With this circumstance in mind, I switched my focus to what needs to be done to make this group happen. 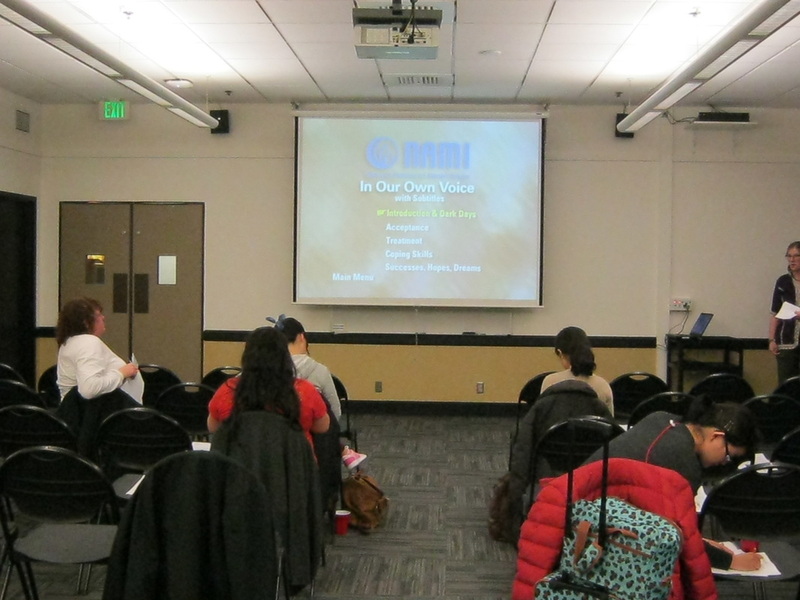 ​Attend NAMI's required facilitation training program being offered in January. 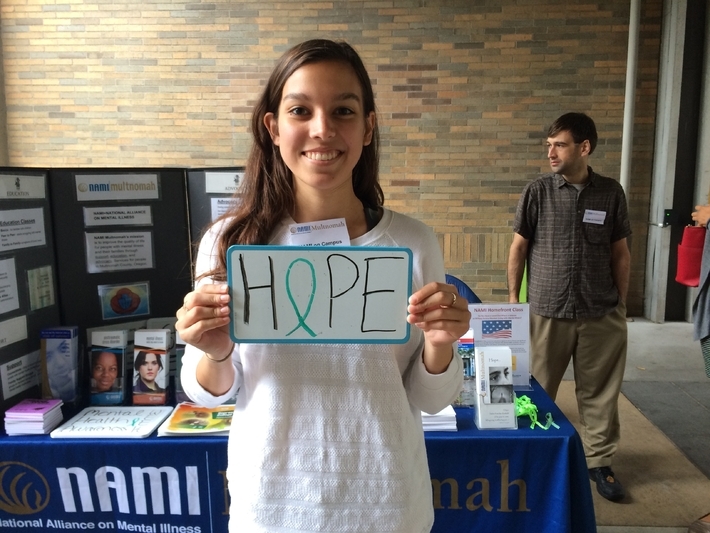 Attend NAMI Suicide Prevention training to know how to address the issue in support groups. Attend more support groups to know how to effectively run one, and to build contacts. Phase 3: This phase involved advertising. I will put the word out about this group via contact with other groups and organizations on campus, and by staging events such as tabeling with the NAMI On Campus club. I also plan on attending more support groups and Toastmaster clubs to continue to build my facilitation skills. October 7th & 8th we conducted a tabling event in which we attempted to recruit fellow students into joining our group. We discussed with them what NAMI was about in terms of the services that they offer people, and how this new club can be beneficial to them. By the end of the event, we ended up recruiting about 8-15 different people into our group, most of them showing up to our interest meeting November 4th. 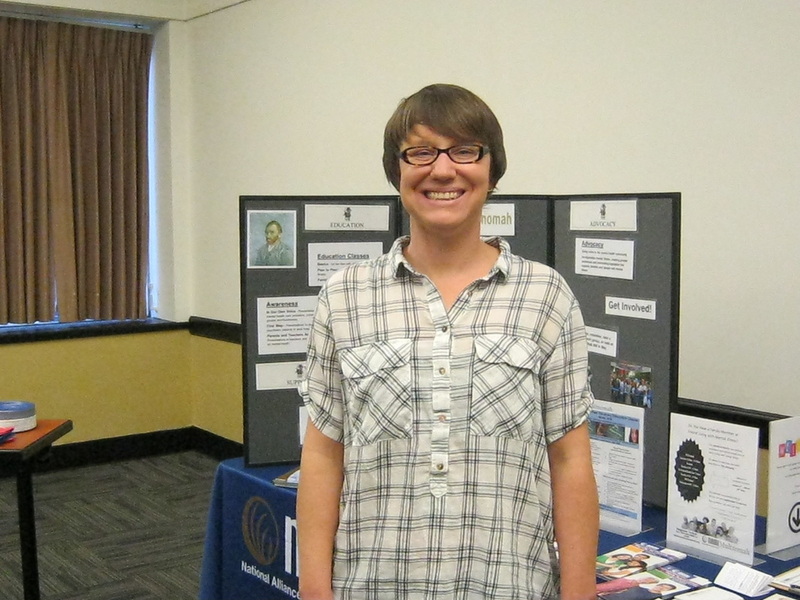 November 4th NAMI On Campus conducted the first Interest Meeting. This was an event where we met with most of the people who either signed up during our tabling event or contacted us outside of it. We told them more in detail about what our group represents and how it can help them, defining what the group is and is not, and was in general a discussion forum. We then held a survey at the end in which most of the people attending the meeting were interested in the support group idea that I had presented. 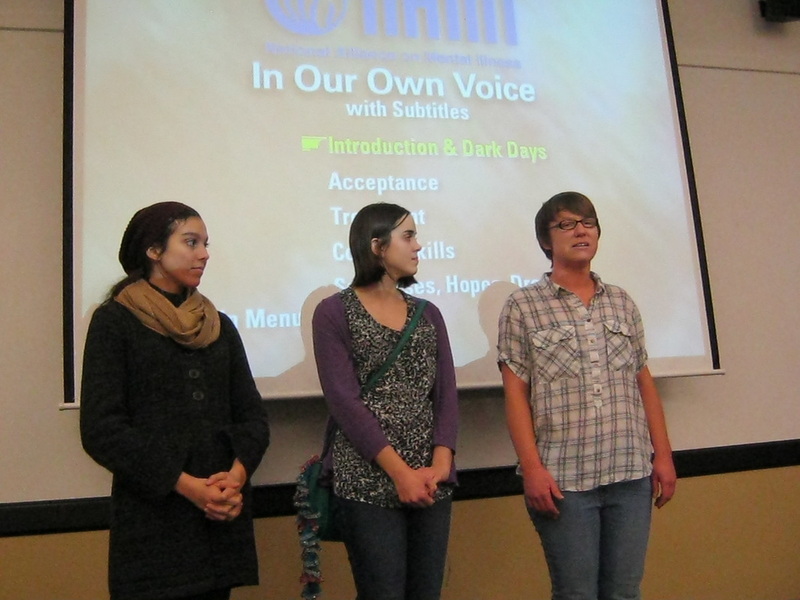 Each of the speakers took turns discussing their own experiences in dealing with mental illness. A video was played to the audience which contained interviews of others dealing with the same issues. Cindy Wolf introduces the lecture to the audience. The audience in attendance. There was a brief Q&A at the end of the two hour lecture where the attendees shared their experiences as well. 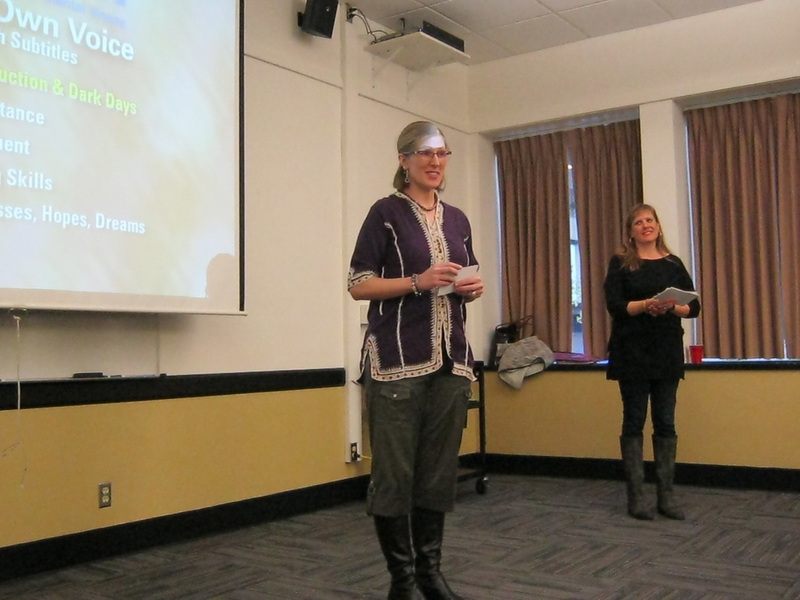 The NAMI In Our Own Words was a lecture that took place November 30th 2015 in the Smith Hall. Two speakers discussed their own experience in dealing with, seeking treatment, and coping with their own mental illness. Also shown was a video was shown that contained interviews of other people dealing with their diagnosis, how it effected them, and how they cope with it. It was not all dreary though, as there were stories by them and the speakers about their recovery, what they look forward to, positive achievements in life thus far. The impact that this group has had on me has been a very positive one. Although I must say that I was disappointed that my original goal of heading a support group was not realized, I have come to recognize the positive that has come out of this group as being a positive in addition to the support group that I will hopefully work to achieve this next term at PSU. In helping putting the NAMI On Campus club together with me and four others, I have taken part in something that has given students hope and support, which will lead to a positive outcome for this support group in the future. I have seen the positive in my partners as they have the rewards of forging new relationships with their peers based on support and encouragement of one another on a common issue. My NAMI Peer-To-Peer training has had two impacts on me personally, first, I have learned that a lot of what I experienced in life was not my fault and that I should be easier on me about who I am as a person. It was very liberating to realize this, and very freeing. Second, I learned through observation how to take charge and run a structured support group by watching the two people who led the group and their methods which focused around fairness, structure, mutual respect, and allowing people to express themselves. I would say that this has had a great impact on me in the regard that I know how to effectively run a support group for my next term. Carrie and the rest of the people that I work with has benefitted immensely from this experience as well. Mostly through reaching out to others and helping them realize that they too are not necessarily to blame for their illness. By giving hope to others and working to overcome the stigma in our society, we build our own self-esteems and self-worth. The same can apply to the impact that this project has had on students at the PSU community. Truthfully, impact is kind of hard to measure at this point as it is so early in the group’s creation. From what I have seen and the connections that I have made with the people who have signed up at our tabling event, the impact has been very positive with the students. The students want a support group to which they can feel understood and supported. Therefore, it is something that is more critical to put into place and would have more of an impact on students then a group…Although obviously the group can offer the same support. I look forward to how much farther I can take this experience and this project. In my next term time permitting, I will take the facilitator training in order to guide a support group. The more I spend my time connected with others who face similar obstacles, the more I build my own self-worth and self-esteem. I think that is what I get most out of this capstone.